We are a family business based in Hungerford, Berkshire. We started our garden business in 1999 offering a high quality professional garden maintenance service, since then our gardening team has grown due to the popularity of our many services. We offer owners of both domestic and commercial properties a great range of garden services. All our gardeners are fully trained and have many years of experience providing garden services in Berkshire. 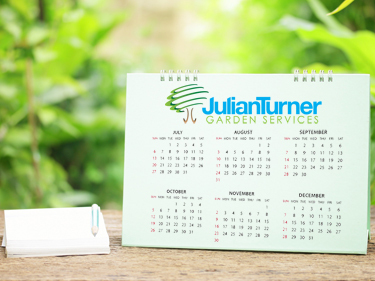 Julian Turner garden services takes the time to understand each client's needs and wishes for their garden or grounds, finding out whats important to you so they are offered a truly bespoke service. If you're looking for a professional garden maintenance service with a personal approach at competitive prices, you found the right company! We are dedicated to providing 100% client satisfaction - that's why we make sure we offer garden maintenance clients have a tailored service to meet your needs for your garden. When you use our services, you will have direct contact with your own personal gardener who will be able to offer you a friendly, professional and efficient service. We take the environment very seriously, we avoid using any environmentally harmfull chemicals and encourage planting that will help insect and wildlife. Because the environment is important to us we use low emission equipment and are always keeping up-to-date on enviromental issues. Green waste is an area that we can all help in and at Julian Turner Garden Services all are green waste is recycled. Are gardeners are happy to offer advice if needed. If you have any questions about our 1st class Berkshire garden maintenance services, please contact us and a member of staff will return your call as soon as possible. Julian Turner provide professional garden maintenance in Newbury, Hungerford and the surrounding area of West Berkshire. At affordable prices so your garden looks its best all year round.